How would you like an in depth look at the Oriental cat breed profile from an expert? You've always been attracted to Oriental cats and just want to make sure the breed is right for you before finding a kitten. 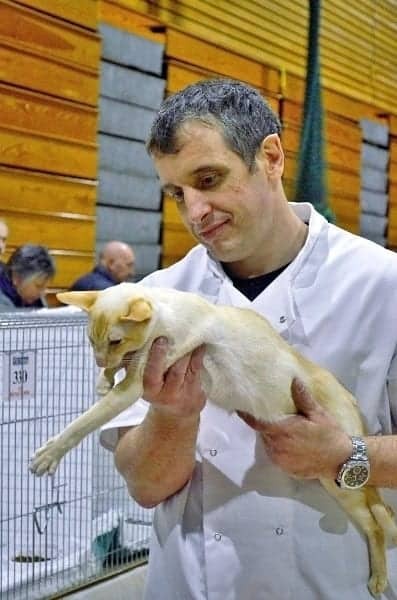 So as a GCCF Oriental cat judge and Oriental cat breeder I am sure I can help. Let me introduce you to the wonderful Oriental cat breed. Oriental cats are a very intelligent breed of cat that are very affectionate and demand attention from their owners. They are extremely vocal and are very happy to tell you exactly what they think. The Oriental cat is very closely related to the Siamese and they are in fact often bred together. 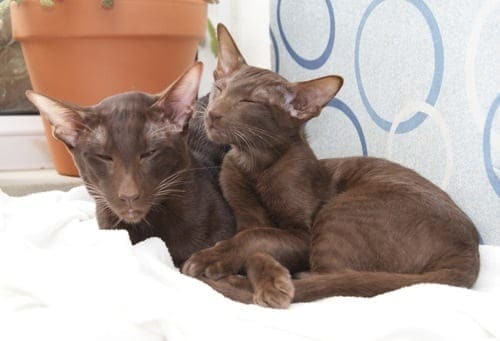 An Oriental cat bred with a Siamese can produce a mixed litter of both Siamese and Orientals in the same litter, this is in fact an established breeding practice. Oriental cats have green eyes and come in a variety of patterns and colours in both long and shorthaired varieties. Like the Siamese they have large ears, long faces, tall legs, tubular long body and a long tapered tail. The basic patterns are divided into selfs and non selfs. Selfs being cats that are all one colour and non selfs being cats that are not all one colour such as bicolour, tortie and tabby cats. There are two styles of Oriental, one is the moderate or traditional look of Oriental and the other type of Oriental is the modern style. Both the modern and traditional styles are easily found as both styles are popular with different breeders. In the 1880’s when Siamese cats were imported from Thailand both the self and pointed varieties were imported. Through selective breeding the favoured pointed variety became the norm, the non pointed version were not favoured at the time and many believe these were what we now refer to as the Oriental. Despite their early lack in popularity, this was not the end for the Oriental. In an effort to increase the gene pool after the second world war, Siamese were cross bred with many breeds such as the Russian Blue, Abyssinian, British and also the common Moggy. These offspring were the foundations of the Oriental cats we know today, though they only began to reach recognition as a breed in their own right in the 1950’s. Oriental cats come in the widest variety of colours and patterns than any other breed with almost 300 different varieties! The Siamese and Oriental cat may have different coat and eye colour but underneath these basic differences in appearance the two breeds are identical in both temperament and personality. Oriental cats and kittens are very intelligent and loving. Extremely active and playful and love both feline and human company. Orientals are probably best paired with another breed of similar temperament such as Siamese, Abyssinian or Burmese rather than the more sedate breeds such as the British Shorthair or Persian. If you are looking for a pet that is very active, talkative and demands your interaction then the Oriental cat is an ideal candidate. "﻿If you are looking for a cat that is not particularly demanding and happy left to their own devices then perhaps the Oriental cat is not for you." The shorthair Oriental is requires very little grooming, owners usually find just the normal petting and stroking of their cat and the clipping of the claws is all that is required. The longhaired varieties require only weekly grooming as although the coat is long, it is also thin and silky and has no undercoat, which decreases the occurrence of matting. There are varying degrees of inherited health issues and just like every other breed, the Oriental cat does have a couple of potential health problems to be aware of. Oriental cats have an elongated face which some believe leaves them prone to dental issues. They are also more prone to feline obsessive compulsive disorder which can result in over grooming to the extent of leaving bald patches. Cardiomyopathy is present in the breed but thankfully not very common. Some Oriental cats display kinked tails and cross eyes, neither should really be classed as health issues, rather breed traits. Progressive Retinal Atrophy is present in the Oriental gene pool and is thought to cause blindness in later years. Hepatic Amyloidosis and Feline Lymphosarcoma are two diseases that are believed to be inherited. With Amyloidosis there is no cure and with Lymphosarcoma courses of chemotherapy have proved successful. Below are some Oriental cat pictures including examples of some of the different colours and patterns. Please feel free to contact us if you would like to contribute any photos of your own cats, we would love to include them! How long do Oriental cats live? Life expectancy of Oriental cats is generally good with reported lifespan of 10-15 years. 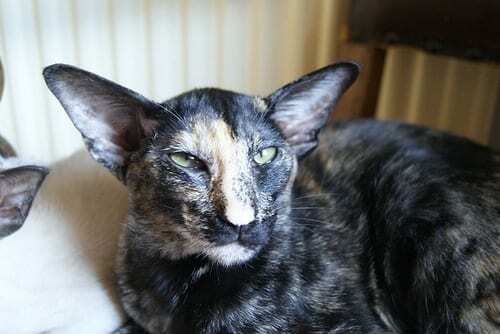 Do Oriental cats need a feline companion? Oriental cats are very sociable and intelligent and crave both human and feline company. If you are out of the house for extended periods of time (such as going to work) then a feline companion is recommended. Though no cat is truly hypoallergenic Oriental cats are known as one of the more hypoallergenic breeds. What do Oriental cats eat? Feed them a premium quality complete diet cat food just like you would any other cat. Oriental tummy's may be a little more delicate so be prepared to change their food to one that agrees with them. If at all possible feed your cat the food the breeder advises. Oriental Cat Breeder - A website with multiple breed related articles.